Everyone is welcome here and it is the friendliest forum I have come across. 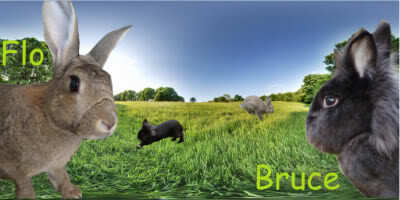 There is a meet and great bit that we encourage people to post a bit about your bunny and yourself. Feel free to join in on any threads and post questions or thoughts on new threads. I hope you will enjoy it here. It comes highly recommended and I am glad I joined. I will post an intro bit after I read through the others. I am thorough like that! But I couldn't resist to comment on what a handsome bun you have on your profile picture! I look forward to meeting everyone and chat to you in the forum. We hope you enjoy it here. Cant wait to hear more about you and your buns. Thank you - that's Flo. Your Dominic doesn't look so bad either! Dominic reminds me of my Pud. My names not really Cerci!! But it's no surprise that my name's not Cerci.....it's a pet name my cousin gave me because he couldn't say my name and it stuck. Can't remember the last time I was called by my real name from them!! cerci wrote: But it's no surprise that my name's not Cerci.....it's a pet name my cousin gave me because he couldn't say my name and it stuck. Can't remember the last time I was called by my real name from them!! Hilarious!!!!!! No.....yorkshire originally, now in Wiltshire! I've had the nickname Newshawk since I first went online back in 1996. If it's taken, I use OKNewshawk, but it wasn't taken here. My username is called the zookeeper because I feel like a zookeeper on a mini scale . Location : In my rabbit hole reading with Jenna bun in Kent - England. Cos I call my two lagomorphs 'wabbits' simple! I just chose an obvious 1 I guess lol. I just thought it would be appropriate for a bunny forum. BugsBunny wrote: I just chose an obvious 1 I guess lol. I just thought it would be appropriate for a bunny forum. I am surprised you havn't, cool. I chose my username as it resembles my bunnies names!